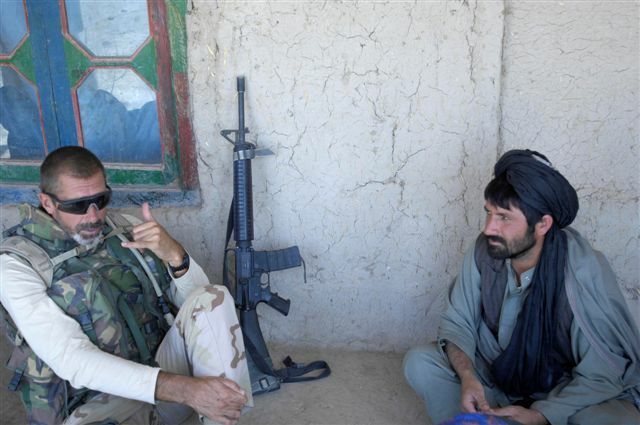 Dutch Army Sergeant Major Jan, 2nd Platoon, E-company, Battle Group-7, Task Force Uruzgan, talks to an Afghan village elder about the needs of his community. Jan also discussed the importance of Afghan people getting involved with local government to improve quality of life issues. The platoon was on a 3-day International Security Assistance Force mission conducting foot patrols through villages to meet the Afghan people. ISAF-photo by Mass Communication Specialist 1st Class John Collins, U.S. Navy. Most of this picture seems to be bogus. Propaganda. The stylish sunglasses of the sergeant, how he sits, his body language in general. The machine gun in the back, within reach. He emanates a kind of baseless supremacy. According to the legend of this picture, he is talking about “needs for the community”. But does he really talk about mobile phones? The sergeant was on a three-day mission conducting foot patrols through the villages to meet the people. The young man to the right should be a ‘village elder’? What do you think is he thinking? In contrast to his discussion mate, he seems to be completely at peace with himself. He listens carefully. Obviously, he is even a bit amused, but not too much to be impolite. Aghanistan is now at war for almost 30 years. It has been a playground first for the late Soviet Union and the US American CIA, then the Taliban, then G. W. Bush’s war on terrorism. We know that before that, Britain completely failed in getting control over the proud people there in at least three wars, around 1840, 1880, and at the end of WWI. Do people learn from history? This entry was posted in Afghanistan, USA and tagged Anglo-Afghan wars, Isaf, Nato, Theodor Fontane, war on terror. Bookmark the permalink. 4 Responses to Mobile Phone?